ST. PAUL, Minn. — Individuals who are transitioning from military to civilian life have numerous details to sort out, including how to translate their experience on resumes. In her new booklet, Quick Military Transition Guide, author Janet Farley pinpoints which military words and phrases should be excluded from resumes. “War/combat: You may have been at war or know how to be, but employers don’t want the details. They want to know if you can do the job you’re applying for. Battle rattle: Unless you’re applying for a job in law enforcement or security, it doesn’t translate. If you are, it’s called body armor. IEDs: Nobody likes to hear about bombs. If your job was diffusing IEDs, consider yourself a conflict resolution technician or crisis manager for the purpose of your resume. PT: You know it as physical training, but it probably doesn’t have a place on your resume or in the interview conversation unless it is a requirement for the job itself. Additional information can be found in Quick Military Transition Guide. The booklet is available from JIST Publishing in a package of 10 copies. 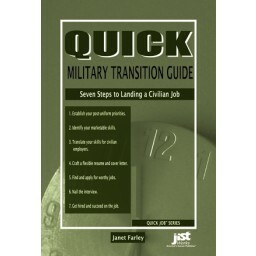 Janet Farley is the author of Military-to-Civilian Career Transition Guide and is also an experienced outplacement career specialist in the job search assistance field. She worked for six years as a military transition counselor and later as a career center manager with the Army Career and Alumni Program at various locations throughout the world. She is also a freelance writer who specializes in job search advice.